Christian Fiction: What is Going On? Before I share my thoughts it's important to me that those of you who are authors understand I am not attacking your books. Your cover is not your book. It's not your story and in most cases it's not your creation. I am writing this post because I believe your publishers are selling your stories and your market potential short. I believe you could be reaching a wider audience. I am also writing this because in recent discussion about the whitewashing of covers Christian publishers have slipped under the radar and that needs to change. I also think that there are probably some of you out there who are unpublished because you've written a story that doesn't quite fit in the parameters of Christian fiction, but is so faith driven that general market publishers are a little scared to touch it. I'm writing this post because Christians are more than conservative middle aged white women and because books should be the place where ideas are expressed and minds are allowed to be challenged and grow. I used to really love the covers of Christian fiction books. For the most part, they were stunning and beautiful. But I've noticed recently that the covers are starting to take a turn for the worse. In fact, I'm starting to actively dislike many of the covers I find in Christian fiction. Tonight when my friend Deborah of Books, Movies, and Chinese Food sent me the link to the forthcoming books from Thomas Nelson, I almost felt sick to my stomach as I looked at the covers. Not only were so many of them unappealing, they had redesigned some of my favorite covers and made them unappealing! If you go look through the catalog, you'll notice a very disturbing trend. 1) Modern looking white women on the covers of historicals with a goofy smile pasted on their face. 2) Books by men, however, have no cover model. 3) The one multicultural book by a woman doesn't have a cover model! In fact, it's not quite possible to tell the race of the characters. This is unacceptable. Let me further make my point by example. Madeleine's shared history with the king holds the key to her family's life...or death. Seventeenth century France is an unsafe time to be a Huguenot. By order of King Louis XIV, all French Protestants must immediately convert or face imprisonment--or death. The king's dragoons ferret out the nonconformists, pillaging villages and destroying homesteads. When the king's soldiers descend on the Clavell estate, the family's fate hangs in the balance. Quickly, quietly, they send their two sons into hiding, trusting that the young age of their daughter will guarantee her protection. But the dragoons will not be dissuaded; they hold the manor hostage looking for clues of their guilt or innocence. However, Madeleine Clavell, the lady of the manor, holds a secret--one possible chance to save the family. She and the king share a past. 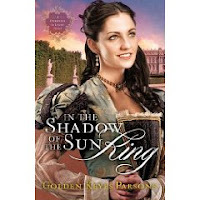 Once a beautiful young lady in the French court whom Louis loved, Madeleine travels to Versailles to plead for mercy from the fickle king, hoping to regain his favor and save her family. It's a gamble, but she is left with no other choice. Madeleine soon faces an agonizing decision--one that changes her family forever. Hmm. Does the heroine on the cover of the second book look remotely like she's facing death and the death of her family and an AGONIZING decision? I have a distaste for covers with faces as it is. But this recent upswing in putting white women with goofy smiles on their faces on the covers of Christian fiction books is unacceptable to me. It's not just a few covers either, it's a strong trend. Deborah pointed out that Christians don't like to see other Christians unhappy. I'm afraid she's right...this points to a larger problem of superficiality in the Christian subculture. But books...books of all places should be where we are free to express our deepest and truest selves. And that's where my next concern comes into play. For a long time I've championed Christian fiction. I still hold that the best fiction I read is strongly motivated by faith. But most of what gets labeled and published as Christian fiction is escapist fiction. It is already well known that for the most part Christian fiction is owned by evangelical Christians. Some books have strong messages about an evangelical way of being a Christian. But as such, it should not be called Christian fiction, it should be called Evangelical Christian fiction. There are some exceptions. The Betsy Bliss books by Beth Patillo come to mind. But for the most part there is a box that a lot of Christian fiction resides in. It's not that I think publishers want to stay in this box. I bet there are quite a few that would enjoy breaking out of it. But they believe their market is the middle-aged conservative white evangelical Christian woman. And they believe she only wants to read a certain kind of book. But it's self-defeating because as they continue to only publish this kind of book, they continue to limit their audience to her. THE AUDIENCE IS NOT GOING TO GROW IF YOU DON'T PUBLISH BOOKS FOR THEM. This is why I felt sick to my stomach. Christian fiction as it stands today excludes so many Christians. There is not enough theological diversity. There are not enough characters of color. There's no place for the GLBT Christian and there's very little for the person who wishes to be challenged in their faith as they read. Furthermore, I think we need to take a hard look at the popularity of Amish fiction. While I agree that the emphasis on community and the simpler life are big reasons these books are popular, it might also be the fascination with the Other. But if so, why does this same fascination not extend to other groups of people who are different? As much as it grieves me to say this, is it possibly because of the completely white Amish communities? This rant of mine, if you will, is not because I dislike Christian fiction. Once again, I must state that there are many Christian fiction books that have meant so much to me. I'd like to highlight two. I think Cook deserves major kudos for publishing Wounded: A Love Story by Claudia Mair Burney. This book shows the potential of Christian fiction to me. It's about stigmata which is largely a Catholic phenomenon and something I knew nothing about before reading the book. It challenged me and encouraged me and made me think about my faith. It was the first time I saw some expression of ideas I've had before in print. And it proudly shows an African American woman on the cover. Publishers take note: it can be done. The Passion of Mary Margaret by Lisa Samson is another example. This book leaped outside the box for me. Mary Margaret's interactions with Jesus and her the way she gave her life for Him and represented the incarnation made me crave deeper intimacy with God. I want more books like these, please. Look, I get that publishing is a business. So I'll make a deal with you publishers. If you take a chance and buy some books that think outside of the box, if you cast your nets a little wider and embrace a larger portion of our Christian brothers and sisters, if you publish books that don't wrap up neatly and tidily, if you stop showing white women with goofy smiles on the covers, and if you do more to promote your authors of color, I'll do my best to promote those books. So let's talk. Tell me what you've got coming up that you think matches these descriptions. For the love of God, prove me wrong.